There are a lot of reasons that people are coming to the Villas at Ashlake. For Patti and her husband, George , it was all about the floor plans! “Over the last two or three years, every time there was an article in the paper about a new active adult community, we explored it,” says Patti. “We really did our homework. We pored over floor plans from a number of developers. Then we heard about the Villas at Ashlake, and nothing we had seen could touch the Cornerstone floor plans. We thought, ‘Oh my gosh, this is what we're looking for!’” They found the Ducal floor plan for their dream home. Patti & George are like many couples who decide they’re ready to move to an active adult community, but can’t quite find something that fits their needs. They wanted a smaller home, but plenty of storage. They wanted a maintenance-free lifestyle, but a sense of community, too. They found all of that and more at the Villas at Ashlake! The award winning kitchen in the Ducal floor plan that won Patti & George's hearts. 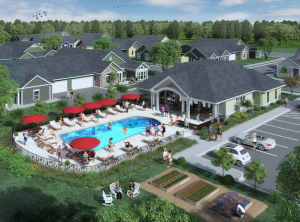 The Clubhouse coming soon to the Villas at Ashlake. Though Patti & George are young baby boomers, they knew a great opportunity when they saw it. “When a community like this is built, people our age start looking around,” notes Patti. “We had seen the clubhouse, pool, and amenities at the Villas at Magnolia Lakes and wanted something comparable. We knew this is what we wanted and where we wanted, and we didn't want to miss the boat!” They were among the first to buy at Ashlake! 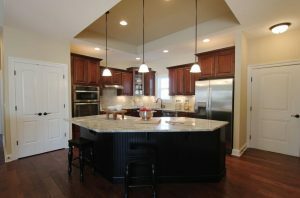 As for the process of building their home, “We’ve enjoyed building a home with Cornerstone from scratch. We liked having the option of building the second floor if we wanted to. We also liked that our home will be zero-entry, which the other builders could not promise. Everyone at Cornerstone has been extremely helpful, and we look forward to our move.” The luxurious, maintenance-free lifestyle is one of our guiding principles at Cornerstone Homes. We want our homeowners to have choices and opportunities. We know that today’s over-55 crowd wants to spend time in leisure activities, traveling, socializing or even taking on second careers - not worrying about their homes. We love it when our new homeowners discover that they didn’t just buy a home… they found a whole new lifestyle, too.